The cloud hosting market is growing at a brisk pace. From startups to major enterprises, most businesses around the world are starting to realize the perks of migrating their business processes to the cloud. Gartner forecasts the public cloud services to grow 17.3 percent in 2019 to a total of 206.2 billion with Infrastructure as a Service (IaaS) to grow 27.6 percent. The cloud providers offer you with various cloud platforms, such as Software as a Service (SaaS), Platform as a Service (PaaS), Infrastructure as a Service (IaaS), etc. for your applications, websites, data storage, software development, as well as complete business processes. However, because of the emergence of a plethora of cloud providers in the market, you must be wise in choosing a cloud provider. 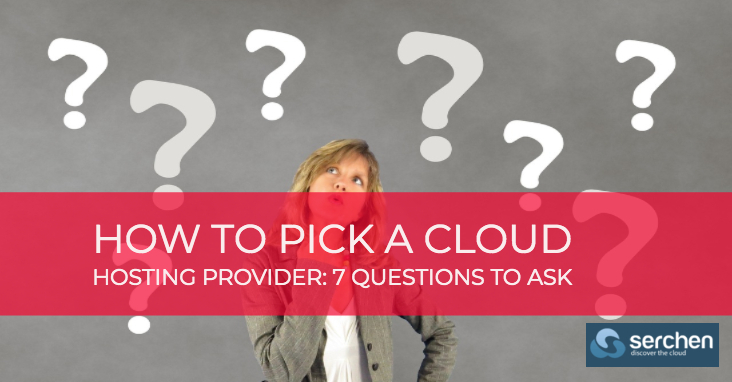 Here are some questions you can ask yourself while choosing a cloud hosting provider. 1. Does the cloud provider know your business? The cloud basically provides you with the resources to host your applications or carry out your business processes on the cloud. However, every application, website, and software vary in the mode of functioning, resource requirements, and other aspects such as security. For instance, some application might need extensive data monitoring, while others a high-performance server with SSD storage. It is always favorable for you if the cloud provider has expertise in hosting your type of applications. Hence, before choosing a cloud provider, you must research whether the provider has expertise in hosting your application or not. 2. How efficient is the customer support? Talk about any industry, whether service-based or product-based; customer support is the thread that weaves the customers and the company into a community. If a company is not able to offer a resolution to the customers’ issues, no matter how good the product is, it is bound to go down the hill. The customer loses faith in the company and consequently, its products and services. However, only resolving the issue is not enough for most customers. The customers must be responded to swiftly, and the issue must be resolved in minimal time. The deployment of an efficient customer support system is the top priority for most cloud hosting providers. The cloud providers are responsible for hosting applications, websites, critical data, etc. for various companies. Hence, it is essential for them to cater to the clients’ issues. While choosing the cloud hosting provider, make sure the customer support is satisfactory. You can do market research about the cloud provider, read the customer testimonials, and ratings. You can analyze the Average Response Time and Average Resolution Time promised by the cloud hosting provider.